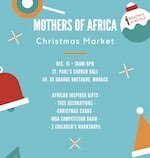 From 10:00 to 17:00, in the church hall, a Christmas market selling African inspired gifts, tree decorations and Christmas cards. There is also a raffle and two children's workshops. To reserve a workshop place, email moamonaco[at]gmail.com. Organized by Mothers of Africa. For more information and reservations email moamonaco[at]gmail.com and visit the organizer's website at: Mothers of Africa.